Possibly the nicest couple in the Pre-Raphaelite world are Arthur and Tryphena Hughes. They married young, remained married apparently without the need of adultery, chloral or any of the other nonsense that seems to litter the lives of others of their circles. 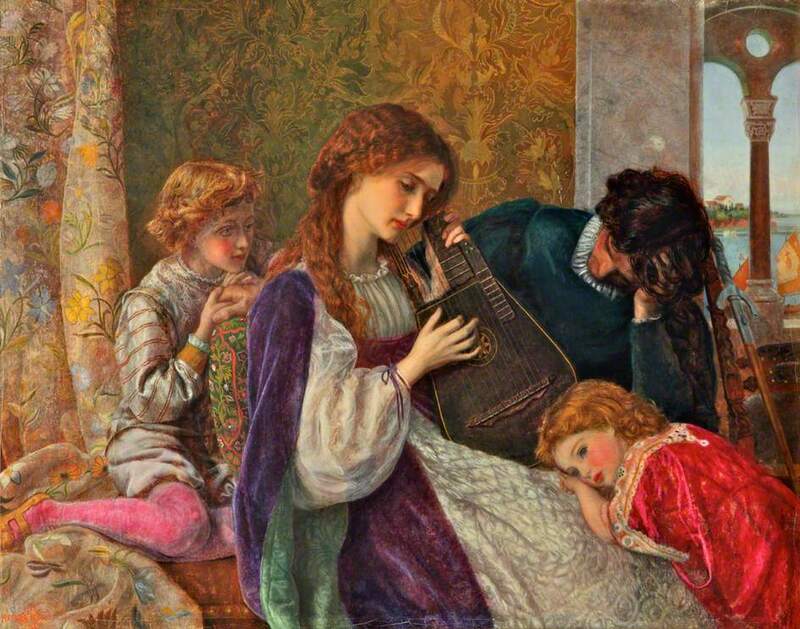 Arthur Hughes (1832-1915) managed to pull off the thing that many of his contemporaries failed at - he happily married his model. The most famous of his paintings features this beautiful young woman, and she can be identified in others of his sentimental pieces, so who was Tryphena Foord? Born in the autumn of 1828 (she was baptised on 14th December), Tryphena was the daughter of Robert and Ann Foord of Maidstone in Kent. Robert was a master plumber and decorator for Robert Cutbush. The Cutbushs and the Foords seem to have been close as on one census a member of the Cutbush family is a lodger in the Foord house. Robert Cutbush is also the brother of Thomas Cutbush, who owned the garden that was suggested to be the location Arthur Hughes used for his painting April Love. 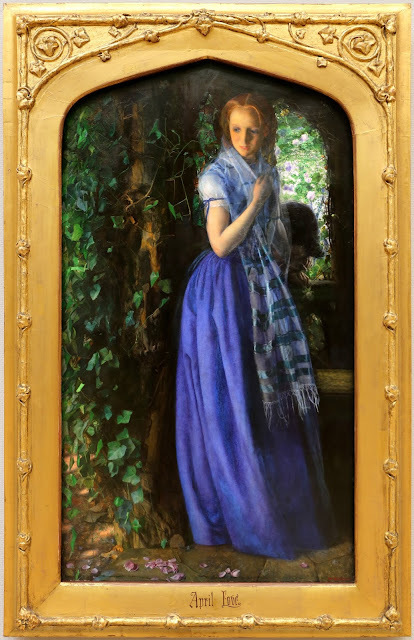 It might have been his search for an ideal location that brought Arthur Hughes into contact with Tryphena, and he apparently met her in 1850, the same year as he discovered the wonders of Pre-Raphaelitism through reading The Germ. In the 1851 census, Hughes is staying with the Foords, and their engagement is presumed to have begun. Much of the work on the figures for April Love was done at Hughes' studio at 6 Upper Belgrave Place, which he shared with sculptor Alexander Munro. It is thought that Munro might have posed for the mostly hidden figure of the man, and the girl was first modelled for by a country girl who left after she didn't like the way Hughes was painting her. Hughes finished the piece using Tryphena, and married her at the end of it. It seems a bit of a strange subject to paint your beloved as, the young couple in the midst of their first fight, the fleetingness of love and all that, but it might not have been the first thought for the painting. 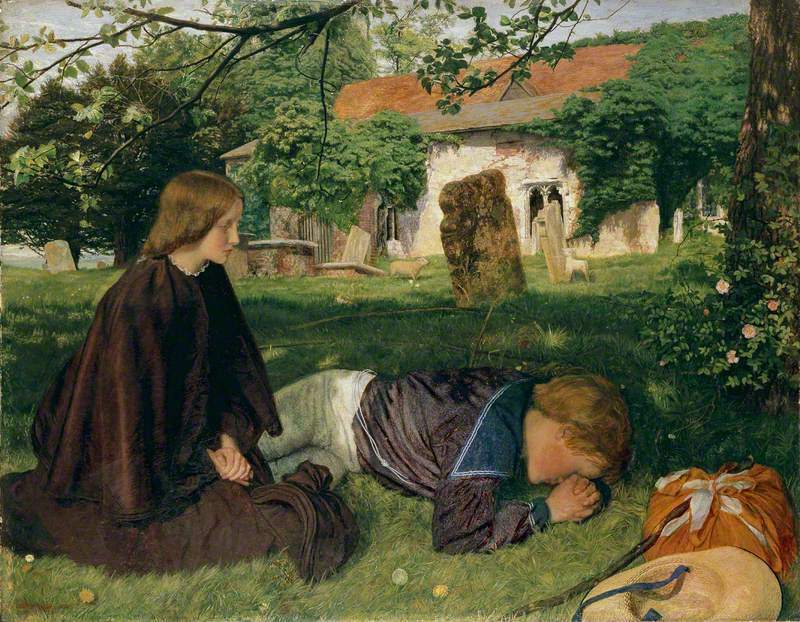 Certainly when Ford Madox Brown saw the painting, he referred to it in his diary as 'the Lovers' quarrel', but William Allingham had apparently called it 'Hide and Seek' (as referred to in a letter from Hughes to Allingham) which hints at an entirely more playful relationship between the two figures. Whatever the thought behind the painting, it united Arthur and Tryphena for the rest of their lives. There are many reasons why Arthur and Tryphena Hughes are not the best recorded of people, which I will come on to, but one person who noted the couple was Lewis Carroll. The Hughes family grew to the tune of six children, three girls and three boys (although middle son Edwin, a twin, didn't live very long), and to their home came Lewis Carroll to photograph the children and their blissfully happy parents. 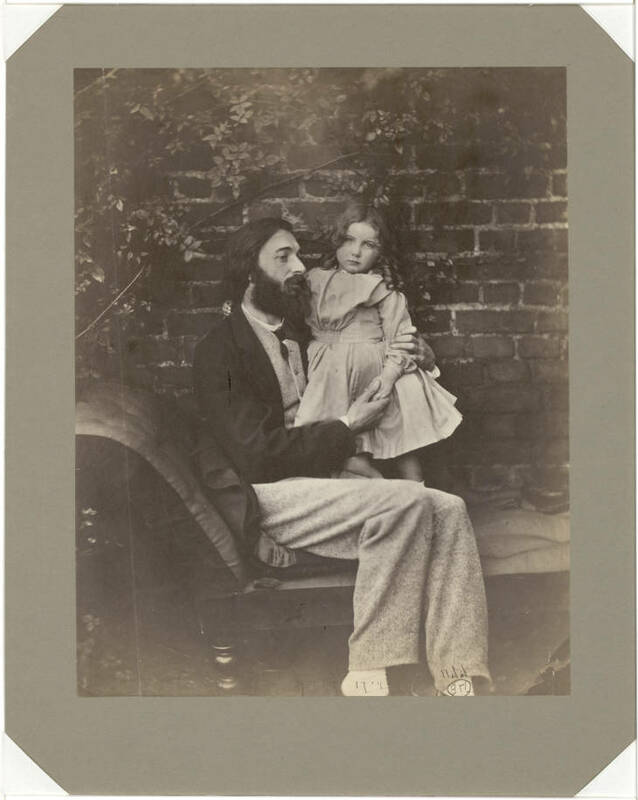 Looking through Carroll's photographs, the Hughes family are quite easy to pick out because they mainly posed against a distinctive brick wall. Lewis Carroll was a visitor to the Hughes home during the 1860s and Hughes painted The Lady with the Lilacs for Carroll. 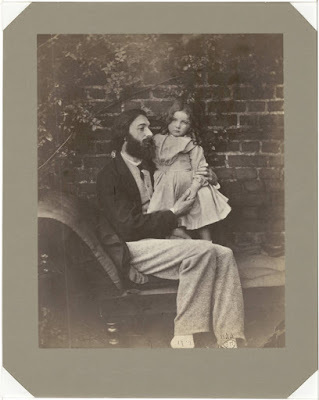 Carroll took portraits of little Amy and Godfrey on their own, as well as family groups of Arthur with little Agnes and Tryphena with little Arthur, and Amy and Agnes (baby Emily was born in 1861, twin sister of Edwin, and Godfrey was born in 1866). Tryphena is quite easy to pick out of Hughes' paintings. 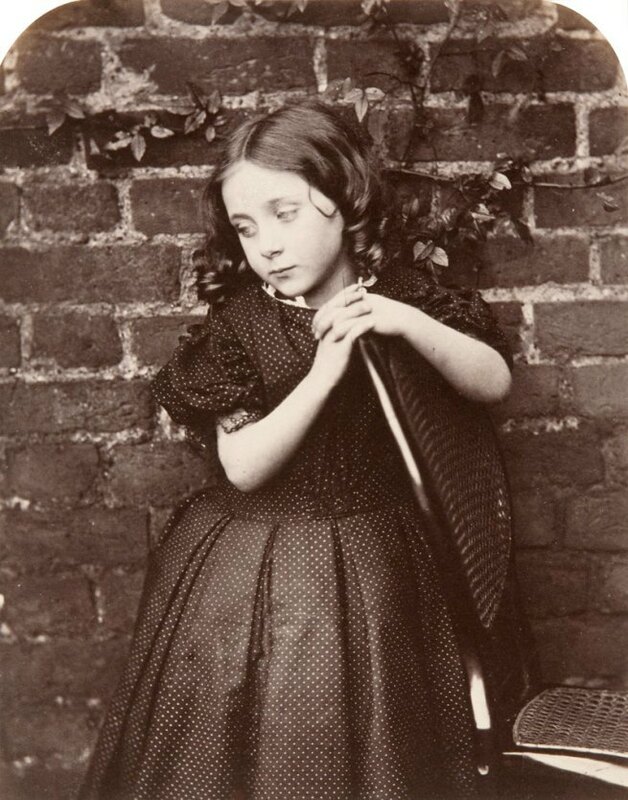 He often makes the most of her copper cap of hair, which is strikingly shiny even in Carroll's black and white photograph, and so she is 'Amy' in The Long Engagement, wondering when her marriage will occur. I have read some commentators suggesting that Arthur and Tryphena also had to wait until they could afford to marry and this painting was a memorial to that period of their lives. Tryphena is also the mourning sister beside her weeping brother on the grave of their mother who has died while the boy was at sea. When the painting was begun in 1857, the sole figure in the composition was the boy, but in the production of the oil, Hughes added his wife as the sister, stoically sat beside her brother, her black clothing suggesting that she had the grief and business of a parent's death to deal with alone. Despite at this point being in her thirties and a mother, Tryphena looks little more than a child in the work. Another of Hughes' paintings that featured Tryphena was the subject of comment from Lewis Carroll after one of his visits in 1864, as recorded in his diary - 'Called on Mr A Hughes, and saw the two pictures nearly read for the Royal Academy, one a lady playing music to her husband and children (the latter done from Totty and Agnes).' The 'lady' was again Tryphena and 'Totty' was the nickname of the Hughes' eldest son Arthur Foord Hughes. 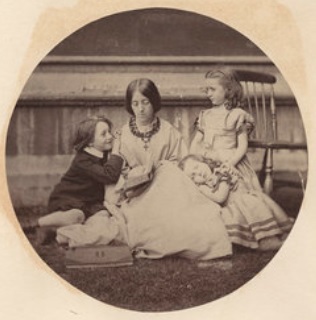 Looking back up at the Carroll photograph, it seems a very similar composition of Tryphena and her children, with the addition of an unknown male model. What is interesting when looking through Hughes' paintings of his wife are how many of them carry an overtone (or undertone) of sadness. Other than the death of Edwin, it is hard to see that the family's life was so melancholic, but maybe that is the point. Tryphena is often portrayed in the paintings as a woman disappointed in love, which is patently not the case but possibly if the Hughes' marriage was unhappy he would not wish to immortalise that on canvas. Again I am struck by Rossetti's joyful celebration of Elizabeth Siddall whom he made so unhappy, so the reverse could well be true of the Hughes paintings. After marriage, Arthur and Tryphena moved to the suburbs of London, firstly to Egham in Surrey, then Beddington near Crydon and then to Kew. It's hardly the rock and roll centre of Bohemain life, but that was possibly what Hughes required for his art. He also was very aware of needing to feed his family so often his work is criticised for being sentimental and commercial, especially in his later works, but again his comfortable, happy family life was reward enough for safer choices. His sons Arthur Foord and Godfrey became artists like their father and grandfather. Eldest daughter Amy, possibly named after the girl in The Long Engagement married John Chester, a vicar, but died at the beginning of 1915, her father dying at the end of the same year. Agnes married an Analyst (who knew there was such a thing in 1891) called John White, but Emily remained at home living with her widowed mother until Tryphena's death in 1921. When my Aunt had to move from the family home she had shared with my grandparents and my uncle for most of her life to a small bungalow, she burnt a large amount of our family photographs and papers which was devastating, however they were hers to burn. 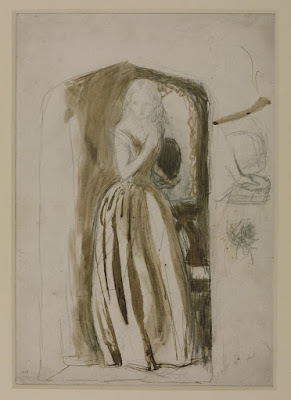 I have read so many accounts of Arthur Hughes' life which all end with the fact that when Emily had to move from the large family home in 1921, she committed an act of cultural vandalism by burning her father's sketches and many of the family papers. I don't believe it is fair to condemn her so harshly, as in 1921 people weren't exactly knocking down her door to celebrate her father's art. He had died 6 years before and possibly she felt that had there been a desire for the paperwork of his life, it would have been requested. Tryphena also could have donated the papers to a relevant collection but again didn't for whatever reason. 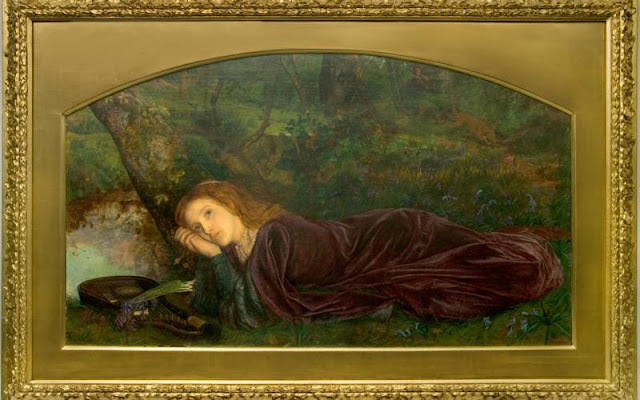 Saying that, it is easy to argue that the lack of minutiae of an artist's life has possibly meant that Hughes is not an 'A' list Pre-Raphaelite artist, despite producing at least two of the best known and loved works associated with the Pre-Raphaelite movement. We will just then have to try harder to include Hughes and his images of Tryphena in the ever-growing conversation of Pre-Raphaelite art.